Looking for a sweet, delicious twist on flavored coffee? Almond Toffee Crunch is a mixture of warm, toasted almond oil, creamy caramel, rich and smooth butterscotch flavors, and Arabica bean coffee to produce a delightful blend of excellence. Although the almond tree originated from the Mediterranean region of the Middle East, the majority of the United States' supply of almonds are grown and cultivated in Southern California. Our flavoring is reminiscent of the almonds having a sweet, less salty taste, and when combined with the flavor of English toffee, this gourmet flavored coffee is nothing short of perfection. 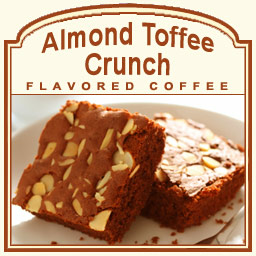 Brewed with a hint of butterscotch, caramelized toffee, and lightweight almond oil flavors, our Almond Toffee Crunch flavored coffee is a pleasant and enjoyable addition to your day. If you are longing for an indisputably delectable, roasted almond taste and aiming to satisfy your sweet tooth, we combine the finest ingredients to create the perfect combination to simultaneously fulfill your cravings. Your taste buds will be immediately satisfied and you too will fall in love with this flavored coffee the instant it is consumed.